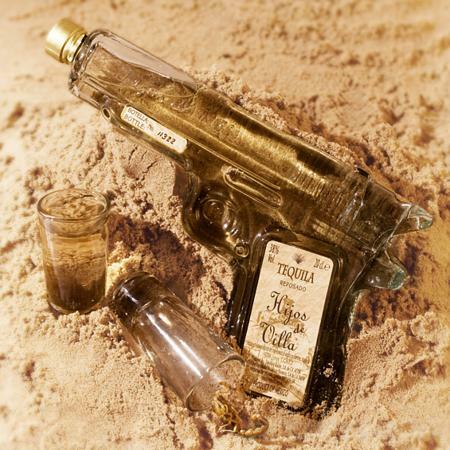 Now here is a Tequila shooter that lives up to its name – the £29.99 Tequila Guns. The next time your mate asks you whether you would want to go shoot some tequila right after work, all you need to do is give a knowing nod, open your drawer and pull out the Tequila Gun that has been sitting in there for this opportune moment. No need to wait until after work, although your boss might not approve of a little tipple during the day. You will be able to pick from the classic cowboy 6-Shooter, or the more contemporary Glock 9mm and shoot – not people, but rather, tequila, as you end a particularly strenuous day at work. Of course, it goes without saying that these are not actual guns, but rather, they are tequila bottles which were made south of the border. These beautifully realized glass bottles have been filled with high-quality tequila, and each purchase comes with a pair of shot glasses as well as a display stand. Definitely not the kind of glass bottle that you would discard once they are empty.